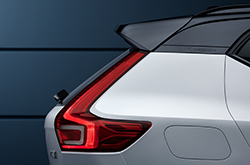 What's New for the 2019 Volvo XC40? 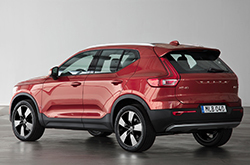 The XC40 is a brand new model that is being added to the Volvo lineup of crossover vehicles. It slots itself below the heavier, larger, and more expensive XC60 and XC90 models that are already in the Volvo lineup. While less expensive than the XC60 and XC90 the new XC40 is still thoroughly well equipped. 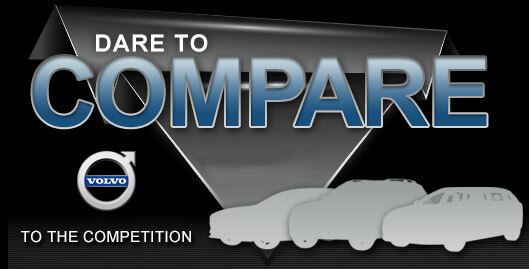 Starting with the exterior of the basic package the vehicle sports 18-inch alloy wheels and elegant LED headlights. Inside the vehicle, you'll find a sleek digital instrument cluster as well as an impressively large 9-inch touchscreen on the dashboard. The car's sound system is compatible with both Apple CarPlay and Android Auto and also boasts three USB ports. 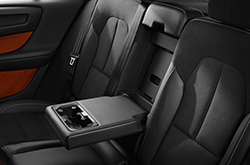 The Momentum trim also comes standard with leather upholstery, as well as power adjustable and heated front seats. Moving up to the R-Design trim bumps the wheels up to 19-inches and replaces the chrome alloy with a sleek matte black. There are a variety of subtle aesthetic changes made to the R-Design as well including redesigned pedals, steering wheel, front grill, and even the leather used for the upholstery is improved. The R-Design trim also features automatic headlights that have active bending, meaning the light emitted from the LEDs are directed to where you are moving, even when turning. Both trims have an option to add the convenience package that adds things like adaptive cruise control that can work even in stop and go traffic. The convenience package also adds a semi-autonomous driver assisted mode. Will I Have A Top-Notch Engine? At launch, the XC40 will be outfitted with a 2.0 liter inline 4 cylinder that's turbocharged to output 248 horsepower and 258 lb-ft of torque. The engine is paired with a smooth eight-speed automatic transmission and uses all-wheel drive power delivery for exceptional traction and stability. This four-cylinder configuration can get 23 miles per gallon in the city and 31 on the highway. Volvo has already announced, however, that at some point they will be switching the engine to a slightly turned down inline 4, still turbocharged, that will put out only 185hp and 195 lb-ft of torque. The fuel efficiency of this engine will almost definitely be better but it has not been assessed yet so the exact number is unknown. 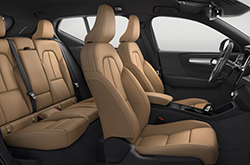 Volvo is well known for its early implementation of advanced safety features and the XC40 is no exception. There are a number of driver assistive features built into the vehicle starting with emergency automatic braking that can identify not only other vehicles, but also pedestrians, cyclists, and even large animals. 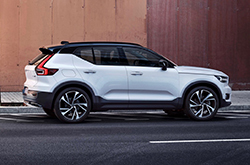 The XC40 also comes with a backup camera, lane assist, and an automatic steering collision mitigation system that will correct steering to avoid running into something. 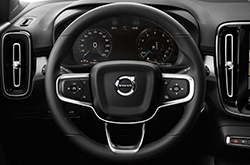 Optional safety features also abound with the vision package adding blind spot monitoring and is available on all trims. The optional safety enhancement package also boasts a number of sensors on the outside of the vehicle in both the front and back that allow for self-parking as well as self-folding side view mirrors and a surround view camera system.